It’s the middle of November and you know what that means! Christmas is coming. My guest writer today is Ruth O’Neil. She’s sharing a favorite Christmas memory as part of her blog tour for her book–The 25 Days of Christmas Family Devotional. Ruth O’Neil has been a freelance writer for 20-plus years. She sees everything as a writing opportunity in disguise, whether it is an interesting character, setting, or situation. You can find her book series “What a Difference a Year Makes” on Amazon, Barnes and Noble, or her website (http://ruthoneil.weebly.com/). You can also visit her on her blog at http://ruths-real-life.blogspot.com/. When she’s not writing or homeschooling her kids, Ruth spends her time quilting, reading, scrapbooking, camping and hiking with her family. That’s a quote from one of my sisters that proves we are related. I think the same way. Food was, and still is, a very important part of our lives, whether it’s celebrating a big holiday such as Christmas, or simply a girls’ weekend together. We usually had Christmas dinner at my grandparents’ house when I was growing up. Grandma spent days baking entirely too much food. (I have taken up that tradition for myself, but at least I don’t have to cook for a few days afterward!) Grandma usually fixed turkey and ham, mashed potatoes, green beans, applesauce, rolls, coleslaw, and many other things. She would fix everyone’s favorites whether we could eat it all or not. That was Christmas afternoon and evening. Christmas morning was spent at home and Mom would always make a special breakfast. Sometimes it was homemade cinnamon rolls or sticky buns, other times it was her famous braided bread. That braided bread has been a Christmas morning tradition in my home ever since the first Christmas my husband and I were married. While food for the holidays is something that is very important to me, there is something better. It’s being together as a family and thinking of things we can do for others. That’s a big part of what my newest book is about. 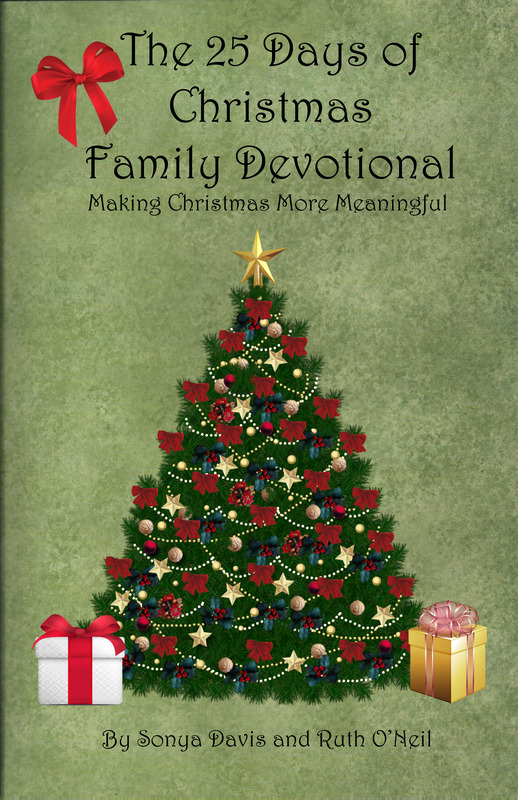 This book is a perfect way for families to spend time together during the Christmas season thinking of and doing for others. It’s meant to be read through in 25 days. Each day contains a story for children, devotion, song, and activity to work on together. Thanks, Ruth, for sharing a memory and information about your new book, The 25 Days of Christmas Family Devotional. It sounds like a wonderful book for the holidays! Thanks for having me today, Lillian!